Zippers tend to scare people off. There really is no reason to be afraid of sewing a zipper. There is a way to practice without spending a cent. Before you discard old clothing, use a seam ripper to rip out the zippers, use your iron and spray starch to give them a new feeling and then practice your sewing techniques with scraps of fabric and your "free" zippers. You can't run a sewing machine presser foot over top of the zippers teeth. You need a special sewing machine foot to sew in a zipper. Learn about a zipper foot. Most sewing machines don't come with an invisible (or concealed) zipper foot but there are plenty of options out there to meet your needs to sew in an invisible zipper. 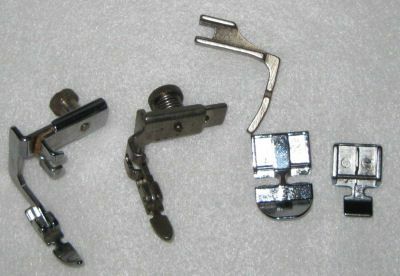 Learn about an invisible zipper presser foot and all the things you need to know to use this presser foot. Jeans with a broken zipper can be found on clearance racks for almost nothing. Don't let the fancy topstitching scare you off. Replacing a Jeans zipper is not a big deal. If your not satisfied with the way a centered zipper application looks when you are done, review this article for directions, pointed and tips to creating a zipper that will be evenly stitched on both sides and something you will wear with pride. The zipper commonly found in slacks and skirts is a lapped zipper application. Find how to sew a lapped zipper and tips and tricks to sewing a lapped zipper her. What Type of Zipper Do I Need? Learn about the various kinds of zippers to know what kind of zipper to purchase when you are replacing or sewing in a new zipper. No need to fear the unknown! An invisible zipper can actually be easier than other zipper applications... and more comfortable if it's an underarm, side seam zipper. Learning about how they are sewn is the best way to understand something new. Watching it happen in a step by step fashion allows you to learn the process, one step at a time. The photos that accompany these directions will have you sewing in an invisible zipper in no time! Free is my favorite price for SO many sewing needs. Free sewing patterns are great but the next step is to save money on all kinds of sewing notions... you may have a pile of free zippers and economical fabric sources and not even realize it! Shortening a zipper to have a zipper the length you want is not a hard task. You'll find step by step directions to shorten a zipper here. A hidden zipper, also called an invisible zipper, is hidden within a seam, without any topstitching on the outside of the garment. This zipper is sewn in differently than a regular zipper but is perfect for many applications. A lapped zipper is a very common way to sew in a zipper but also can be a bit confusing. This video takes away the mystery of sewing in a perfect lapped zipper. This quick article will give you all the pointers you need to sew an invisible zipper and the information to deal with a seam that intersects the invisible zipper seam. Installing an Invisible Zipper Is Easier Than You Think! Should I Preshrink Fabric Before I Sew? Who Doesn't Love a Sewing Bargain?